I’ve been entering contests off and on for years. I don’t enter as many as I used to because of lack of time, but I will enter it if it’s for a prize I really want to win. This past year, I’ve won $500 and a Kindle Fire. I find you really have to look to see if the sweepstakes/giveaway is open to Canada. Most often, they are US only, but I have discovered a few sites that either share only Canada friendly giveaways or have a section for Canada giveaways. I’ve made a list below for my fellow Canadian giveaway/sweepstakes fans to find giveaways that they can enter. It feels terrible to win a prize only to discover it was US only. I always check, but it still happens sometimes! Online Sweepstakes: Choose either blogs only, no blogs, or display all. Giveaway Promote: You can drill down and find giveaways open to Canada. Just Sweep: One of the options is search by location and will show you all the giveaways open to Canadian residents. Contestgirl: On the sidebar, you’ll find a section for Canada Contests. Contest Listing: It has a Canada category. Giveaways open to Canadians Facebook group: You’ll find a mix of non-blog and blog sweepstakes here. I also send out my Canada Friendly Giveaway newsletter twice per month where I share only giveaways that Canadians can enter. In addition, I always list who can enter my giveaways so you don’t have to search to find out if you’re eligible or not. On my Current Giveaways page, you’ll see which giveaways are open to Canada. Where do you find giveaways and contests open to Canada? I wish this one done for the US. I entered a contest once and then it was only for Canada. It happens all the time unfortunately that I start entering a contest and then discover it`s US only. I do try to remember to check all the time but it`s not always clearly displayed or not included in the Rafflecopter under Terms & Conditions. Another thing is that it isn`t always discernable if the blogger is in fact Canadian. Not all bloggers tell where they are and that can be frustrating too. Thank YOU big time for going to the trouble of compiling this list. I had to tweet this out to my twitter followers. A lot of my traffic comes for Canada, so I though they would appreciate this post. Agreed! I did this one and felt so guilty for effectively wasting the blogger’s time. I paid extra close attention (even more so) to whom the contest is open to. So having a list of either Canadian-only or a section of Canadian contests or something similar helps (well, helps me at least lol) reduce the chances of this happening again. Thanks for sharing. Always read the rules, sometimes the US ones you many have to pay shipping or get stuck with paying duty on the prize. Happened to me for the duty. Had to pay $25.00. Thank you, this is good to know! It is hard to find contests that are open to Canadians sometimes, so this makes it much easier! WOW! 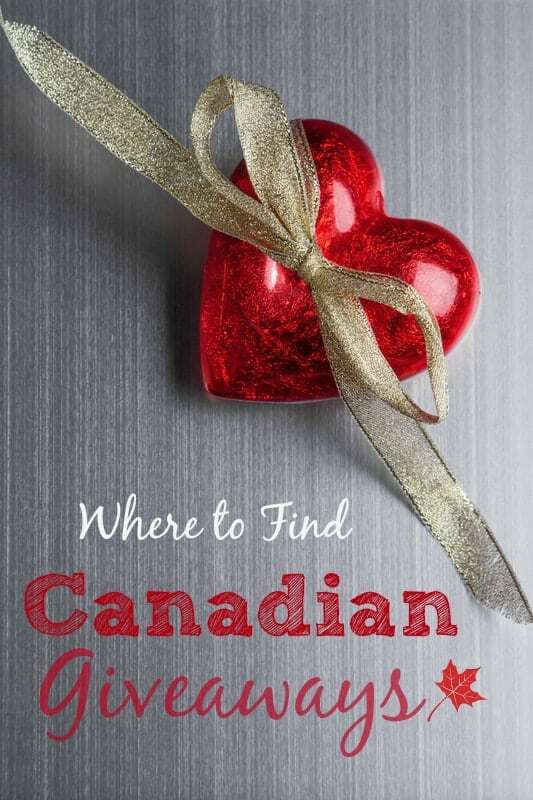 Thanks for mentioning my Canadian Giveaways FB group Stacie! It’s frustrating when contests don’t tell who they are open to. I appreciate that you have a Canada-friendly list and that you list who your contests are open to. Thanks for this list to. It is heartbreaking when you win on what you think is a US/CAN contest and then discover it’s US only. I came THIS CLOSE to winning a really cute pair of designer boots before I was disqualified for being a Canuck. Sigh. Does your newsletter have “clean links” where the link to enter on isn’t a referral link? My newsletter has links to my giveaways and other blogs. I don’t put referral links in there. thank you soo much Stacie! I agree with you~one must always check! This has happened to me many times before where I enter and filling out a form is involved only to reach the bottom and realize it’s only open to US residents OR after you submit your entry you get an email telling you it’s only open to IS residents. So ALWAYS check! I most often visit contestchest.com and regular blogs I read, many of the ones you listed above that have giveaway linkies. Have you ever won a big prize? I won a $3000 bedroom makeover once. Thanks, Stacie! No way – $3,000? That’s amazing! Our naked bedroom could totally use $3,000 to spruce it up, haha!